Ionic liquids are often addressed as “Green Solvents” or are connected with “Green Chemistry”. These claims have been made because many ionic liquids have a negligible vapor pressure. Therefore, they are non-flammable, cannot be inhaled and the most uncontrollable and dreadful way environmental spills pass through the atmosphere can be excluded. Certainly, these aspects make ionic liquids safer and environmentally more benign solvents than conventional VOCs (volatile organic compounds). However, it has to be realized that sometimes for the synthesis of ionic liquids large amounts of VOCs are used, whilst in other ionic liquid manufacturing processes VOCs can be omitted or largely reduced. Furthermore, some ionic liquids are highly toxic, while others are FDA approved. With approximately 1018 different ion combinations that result in the formation of an ionic liquid with a different set of properties, one surely has to refrain from overgeneralization: Ionic liquids are not intrinsically green, but they can be made green, and their use in specific processes may lead to improvements that comply with the principles of green chemistry and engineering. 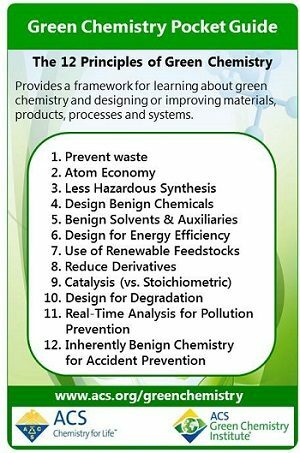 The 12 principles of Green Chemistry as spelled out by Paul Anastas and John Warner are: 1. Prevention, 2. Atom Economy, 3. Less Hazardous Chemical Syntheses, 4. Designing Safer Chemicals, 5. Safer Solvents and Auxiliaries, 6. Design for Energy Efficiency, 7. Use of Renewable Feedstock, 8. Reduce Derivatives, 9. Catalysis, 10. Design for Degradation, 11. Real-Time Pollution Prevention and 12. Safer Chemistry for Accident Prevention. Green Engineering has been defined by the US Environmental Protection Agency (US EPA) as the design, commercialization and use of processes and products that are feasible and economical, while reducing the generation of pollution at the source and minimizing the risk to human health and the environment. Green nanotechnology has been described by US EPA as “the development of technologies for nanotech products, that produces nanomaterials in environmentally safe ways and that their risks to humans and the environment are minimized both during the production and consumption.” In that sense, ionic liquids serve the purpose as technology enablers. By looking at the arguments made in the previous section, it becomes evident that employing ionic liquids alone in the production of nanomaterials renders their manufacturing greener. In nanoparticle (NP) synthesis, the ionic liquid can not only act as the solvent and reaction medium, but also as the templating agent, NP stabilizer and, in addition, can provide size, phase and morphology control. Thus, other additives such as stabilizing agents or surfactants can be omitted in the synthesis. Ionic liquids can also be used for structuring nanomaterials. All of this not only reduces the number of chemicals needed for the synthesis (and hazardous chemicals can be substituted by the ionic liquid), but also the formation of undesirable by-products is eliminated and waste reduced. As the ionic liquids used in most NP synthesis have a negligible vapor pressure, the process is safer. Additionally, due to their low vapor pressure, they can be easily recycled as the reaction medium. Despite the tremendous advantage that ionic liquids offer for the manufacturing of nanomaterials, (about half of the principles of Green Chemistry can easily be satisfied) there is still plenty of room for improvement, especially when it comes to energy and materials (atom) and economic efficiency of the processes. To close this technological gap, and to be able to fully evaluate the potential of ionic liquids in the context of green, eco-efficient nanomanufacturing, new synthetic procedures have been established. These procedures satisfy the principles of Green Chemistry and Engineering by combining ionic liquid technology with unconventional synthetic conversion methods that draw their special advantage in an unprecedented way from ionic liquid properties. Although ILs per se are not green, ILs can be a vehicle to design processes that comply with the 12 principles of Green Chemistry and Engineering.